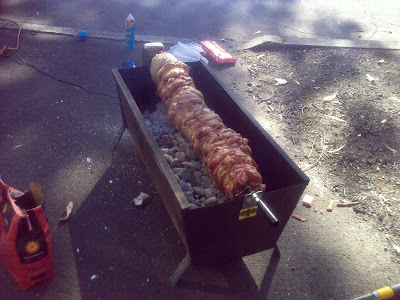 This is cooking right outside my office as I write this. It's for our passover meal tonight. AWESOME! 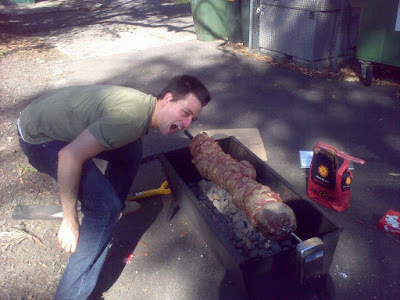 And in this pic (below), Pastor Jono is getting a bit too keen and excited about our meat extravaganza that we will feast on tonight! Ps. This is only half of what we will be eating! DOUBLE AWESOME! 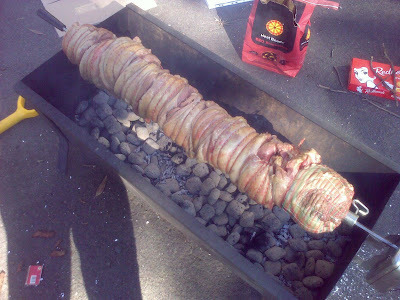 How many times did I want to roast a whole lamb/pig/cow outside the church ... and I'm a vego!! Hopefully it's lamb. Passover requires lamb. Definitely NOT pig or cow.